HEZEKIAH IN THE BIBLE. The royal seal of Hezekiah, king of Judah, was discovered in the Ophel excavations under the direction of archaeologist Eilat Mazar. Photo: Courtesy of Dr. Eilat Mazar; photo by Ouria Tadmor. For the first time, the royal seal of King Hezekiah in the Bible was found in an archaeological excavation. 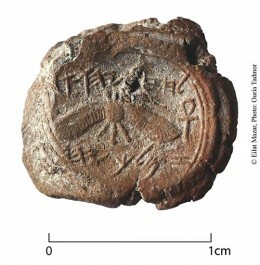 The stamped clay seal, also known as a bulla, was discovered in the Ophel excavations led by Dr. Eilat Mazar at the foot of the southern wall of the Temple Mount in Jerusalem. The discovery was announced in a press release by the Hebrew University of Jerusalem’s Institute of Archaeology, under whose auspices the excavations were conducted.